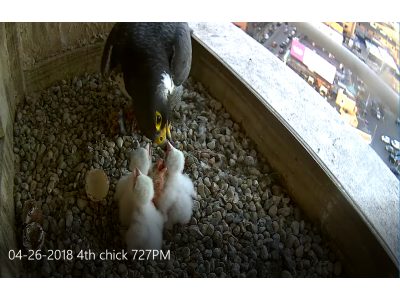 04-26-2018 Fourth chick hatches today! The last egg hatched today shortly after 7 PM. The youngest member of the family will have to catch up fast to compete with his older siblings. Even though they only have a two-day head start, they are so much bigger. Rebecca fed the chicks shortly after the 4th one hatched. In the video, he is still wet from having just emerged from the egg and looks so small compared to the others. After his feathers dry, he will look bigger, but has a long way to go. There have been runts most years since the eggs hatch over a period of several days. Rebecca has always done a fantastic job at keeping all the chicks fed, although the smallest ones may have to wait until the bigger ones get full and drop off to sleep! It will be an exciting couple of weeks as we get this intimate view into their world. PS. I am just using the male pronouns for convenience since we don’t know the gender of any of the chicks.